The architectural landscape of the Maltese islands is very much a Baroque dominated one. Notwithstanding the various architectural styles prevailing in the islands, the Baroque seems to be ingrained in the Maltese psyche to the extent that even churches built well into the 20th century more often than not revert to this architectural idiom – as witnessed by Xewkija’s huge rotunda which was only completed in the 1980’s. 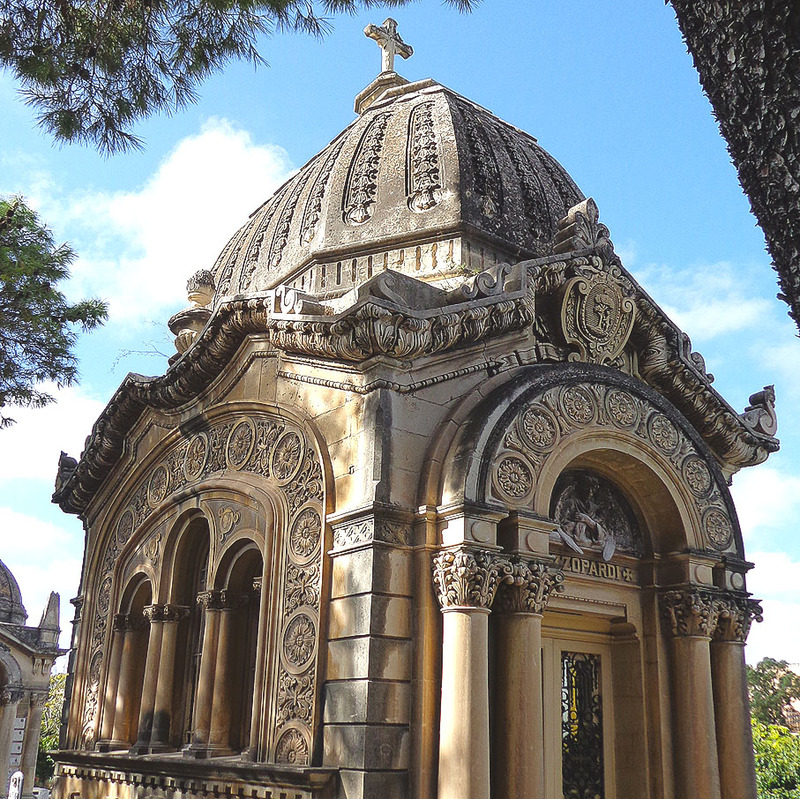 One notable departure from the Baroque is the Santa Maria Addolorata Cemetery – a huge burial ground which is effectively the island’s national cemetery, built in a neo-Gohic style in 1869 by Emanuele Luigi Galizia – at that time principal architect at the government Works Department. Galizia was a gifted man and made exceptionally good symbolical use of the large site’s topography – placing the cemetery’s principal chapel on the top of a hill, reached from the cemetery’s elegant gatehouse through a series of stairways and winding alleyways: the architect’s quaint interpretation of man’s long road to salvation. 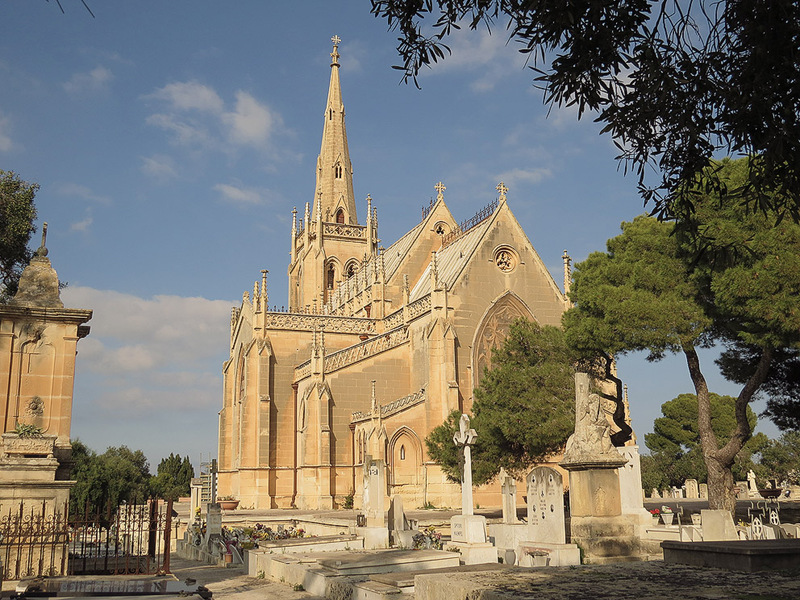 The cemetery – in which well over 200,000 Maltese are interred – can easily compare with some of southern Europe’s so-called monumental cemeteries. Although the number (and quality) of the sculptured monuments is much less than one finds in the grand monumental cemeteries of Italy, the cemetery is characterised by a large number of richly carved private mausoleums in its older western sections which feature a quirky mix of styles ranging from elegant classical lines to the purely exotic – a couple of chapels manage to look more like Hindu temples than Christian memorials – and there is even a curious masonic-style pyramid. 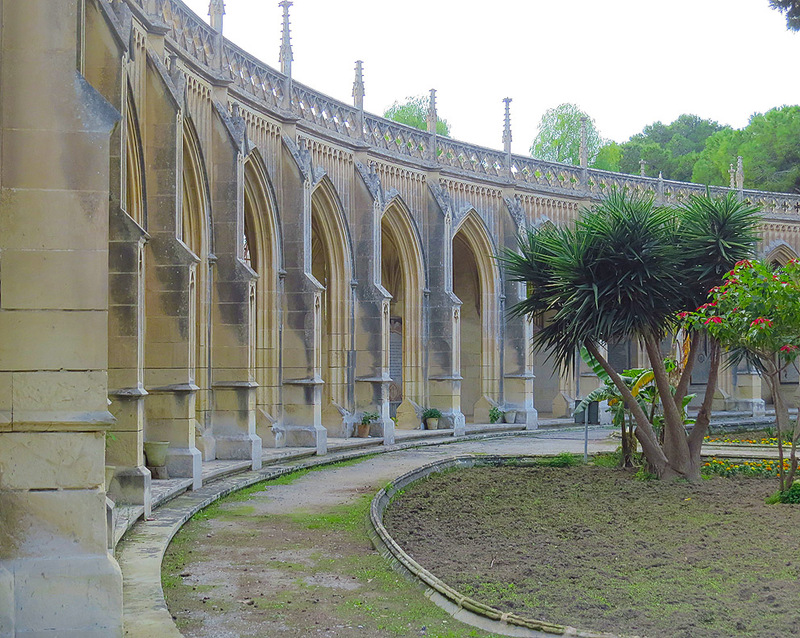 Though the sculptured monuments at the Addolorata are not thick on the ground, there are a few well worthy of note. Perhaps the best known is the touching monument of a well-dressed man grieving on his dead mother(in the main chapel area). This is one of the cemetery’s finest sculptures – curiously the back of the monument retains shrapnel pockmarks from a Second World War bomb which exploded nearby. Also close to the chapel is another fine monument to the four Maltese who fell in the 1919 riots against the colonial government. The monument is the work of one Boris Edwards – a Russian émigré who escaped Bolshevik Russia in 1919 and eventually made Malta his home. As with all cemeteries, a sad air of abandon hangs over the Addolorata – the weathered monuments, the rusting wrought iron, the overgrown weeds; but on sunny winter days the cemetery makes for a highly interesting architectural tour, and the hundreds of chirping robins and redstarts which make Malta their temporary home during the cooler months add a much needed dash of life and colour to this beautiful, if austere, home of the departed.